Set in the sought after village of Southfleet this spacious two bedroom Victorian cottage boasts landscaped south facing rear gardens backing onto paddocks. There is spacious 24 ft lounge with feature wood flooring, the kitchen/dining room has French doors opening onto the patio and gardens with integrated oven and hob. 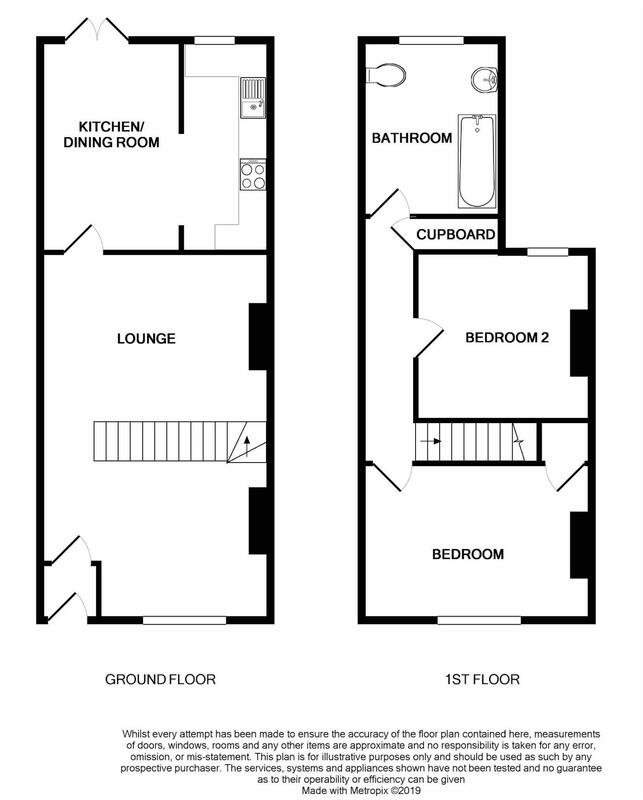 To the first floor there are two double bedrooms and family bathroom. The property has oil fired central heating with newly installed boiler and double glazed windows. The property has the added benefit of being sold with no chain. Southfleet is a delightful semi-rural village offering local primary school, church and public house, ideally situated with easy access of the village of Longfield and Gravesend town centre providing further shopping recreational and educational facilities including mainline railway stations to London Victoria and Charing Cross respectively. The A2 and M25 motorways together with Bluewater, the Channel Ports and Ebbsfleet International station providing a 20 minute link to London St Pancras are also within access. From Clifton & Co proceed down Ash Road towards Longfield, at the mini roundabout turn left onto the Main Road. At the next roundabout turn right onto Whitehill Road, follow the road along. At the crossroads turn left onto Highcross Road, follow the road along where the property will be found along on the left hand side marked by a Clifton & Co For Sale board. 24' 4" x 13' 8" (7.42m x 4.17m) Double glazed window to front. Feature wood flooring. Staircase to first floor. Under stairs storage cupboard. Two radiators. AGENTS NOTE: There is the facility to have an open fireplace to the lounge subject to the necessary checks. 12' 9" x 4' 1" (3.89m x 1.24m) Double glazed window to rear. Vaulted ceiling with loft window. Comprising ample work surfaces with inset single drainer sink unit. Range of floor and matching wall cupboards. Inset electric hob with extractor fan over and matching oven under. Plumbing for automatic washing. Tiling to complement dining area. Access to loft space via retractable loft ladder. Deep storage cupboard. 13' 3" x 10' 8" (4.04m x 3.25m) Double glazed window to front. Built-in wardrobe cupboard. Freestanding wardrobes to remain. Radiator. 10' 11" x 9' 9" (3.33m x 2.97m) Double glazed window to rear with views over farmland. Radiator. 7' 8" x 8' (2.34m x 2.44m) Double glazed window to rear with views over farmland. Comprising panelled bath with mixer tap and hand shower and glass screen. Pedestal wash hand basin. Close coupled wc. Feature wood flooring. Shaver point. Towel radiator. With flower and shrub borders. Screening wall. 60' (18.29m) With wide south facing patio area with screening walls leading to gardens laid to lawn stocked with mature flower and shrub borders. Screening fences. Backing onto paddocks. Oil tank. Outside light. Water tap. Please note the history of these properties they were farm workers cottages and still retain a right of access across the whole terrace. We are informed this property is in council tax band C, you should verify this with Dartford Borough Council on 01322 343434.